History - Guttenberg Fire Dept. The first step in fire protection for Guttenberg came in 1877 when the town council authorized the purchase of its first piece of fire equipment, a hand-operated pump with hose and fittings. The pump, hose and fittings were purchased for a total of $380, a good deal of money then. According to Walter Jacobs, city historian, May 5, 1882 was the birthday of the Rescue Fire Company. Only four days earlier the mayor was given authority by the council to organize the company. On May 5 the membership roster was full. 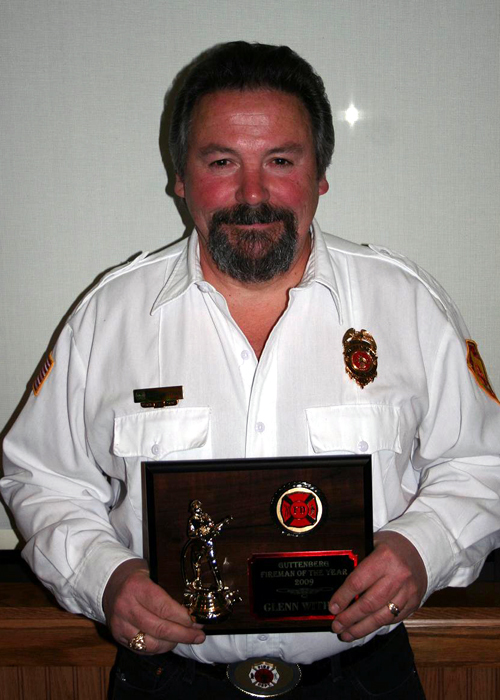 Joe Kirch was appointed chief until the first regular meeting. The town turned all fire-fighting equipment over to the newly-formed company and agreed to take care of all expenses encountered in keeping the equipment in repair. The fire company was obligated to keep it in good condition and ready for instant use. ​“If this condition were not met,” Jacobs writes in the book, The History of Guttenberg, “the equipment was again placed under the custody of the town council.” That has never happened. First permanent home of the company was on the ground now occupied by the Fish Hatchery and Aquarium on South River Park Drive . The pump, ladder and most of the fire fighting equipment were housed in a two-story building on this land. In 1906 hose cart stations were built at each end of town, one at Meuser Lumber Company and the other in a shed in the vicinity of the 400 block of North River Park Drive. The volunteers fought fires with the trusty six-man pump until a more modern piece of equipment became the pride of the force. In 1929, “Betsy” joined the company. Now the Rescue Fire Company had what every self-respecting fire company should have — a truck. But Betsy was a chemical truck. Instead of shooting water on a blaze, firemen could now smother the flames with foam. One gallon of chemicals would produce 16 gallons of foam. The hose carts were now pulled by truck instead of by hand or with horses. After more than half a century on River Park Drive , the men of the Rescue Fire Company moved their headquarters to the Fuerste Blacksmith and Machine Shop which had been bought by the town and turned into a city office and fire station. Construction of the Municipal Building on that location two years later forced another move, this time to Miller’s dairy barn on the north side of town. Dedication of the Municipal Building in 1936 brought Betsy and her keepers back to the center of town. No major new equipment was added to the company until 1952, when the town authorized the purchase of another truck. The new truck had all the modern accessories including a built-in tank to carry water where there were no hook-ups. It cost $9,000. It looked like the end had come for Betsy, but the town council had other plans in mind. Guttenberg was to have two trucks. 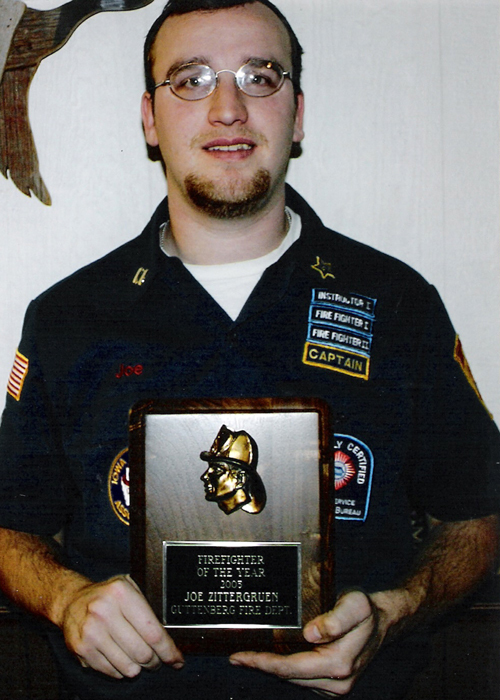 Jefferson Township was organized and the Rescue Fire Co. changed its name to the Guttenberg Fire Department. The new truck answered calls in the country as well as in town, while Betsy always remained in town. A year later, the company saw an advertisement for another truck. It was a demonstrator model and in excellent condition. Four days and $8,000 later, Guttenberg had three trucks. But that was not to be for long. After nearly a quarter century of service, Betsy was retired. She was dismantled and her chassis put under the road oiler. The hose carts which had been used since the company was formed were also retired. After many years of service as a road oiler, the department again took possession of Betsy in 1981, and the firemen restored the vehicle. Since Betsy’s heyday, the department has kept up-to-date on all equipment. In 1953 the city added a fire chief’s station wagon equipped with a radio. In 1969 a new Chevrolet station wagon was purchased. By 1968 it was determined that the department needed more space than what was available at the Municipal Building, and work began on plans for building an addition to that site. That plan was later scrapped when the city purchased the old light plant at a cost of $6,500 in April 1971 to be used as the fire station. The next month firemen began work on renovating the building and in September of the same year the move was made to the new station. The following month an open house was held. Many improvements have been made since that time. In 1972 specifications were approved for the purchase of a new fire truck. In January 1973 Kunzman Motors was awarded the bid for the chassis at a cost of $10,247. 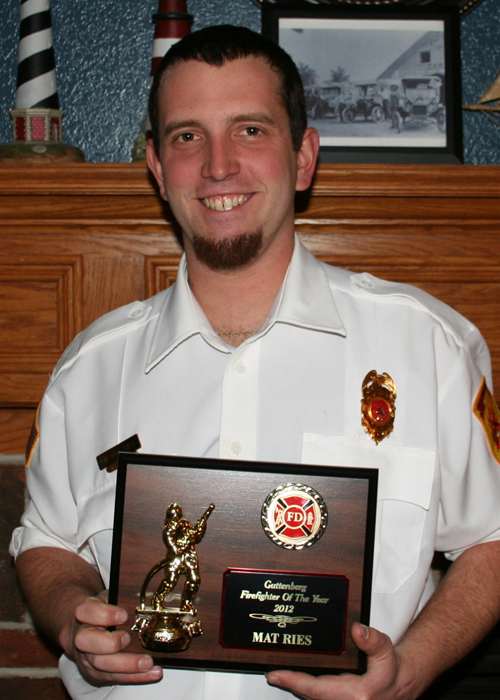 The following month a bid for equipment for the new truck for $19,805 was awarded to Pierce Company, making the total of the new truck $30,052. Smaller equipment added to the department in the past years have included such items as air masks, first purchased for the department in 1967 by the city council, a chain saw purchased by the city in 1970 and life jackets in 1971, also purchased by the city. In April 1972 the department received its first radio for communications, and one year later the firemen purchased a radio for their new truck. The same month Lock and Dam No. 10 offered the use of its boats when responding to drownings. In April 1973, fire department officers and local township trustees met to discuss fire protection contracts. In December 1973 permits were issued for blue lights for use on firefighter’s vehicles when responding to a fire call. The following month the department received a Porta-Power for rescue use. In 1974, work began to finish the upstairs of the building, and the area now includes a meeting room, office, kitchen, restrooms, and lounge area. 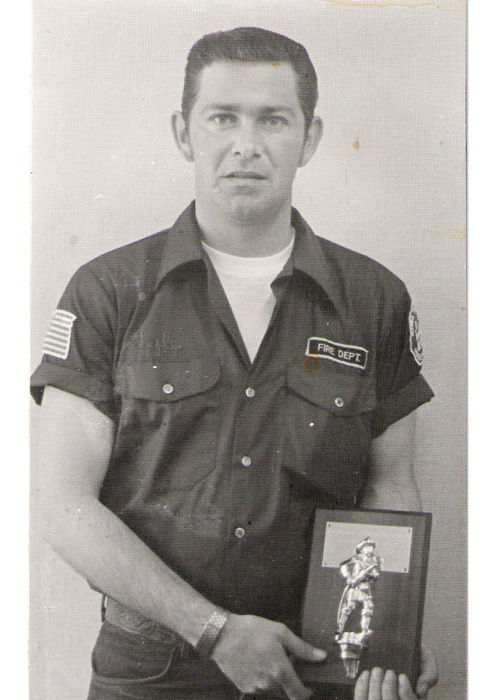 The department contracted with Millville Township and the town of Millville for fire protection in September 1975, and in February 1976 two sections of Mallory Township were added to the local department’s fire protection area. In February 1978, a new fire siren was purchased by the city. In May of the same year, the first hi-band radio was installed in the station wagon with one walkie-talkie. Two years later in May 1980, a radio and walkie-talkie were purchased for the tanker. A communication scanner was added in March 1981. 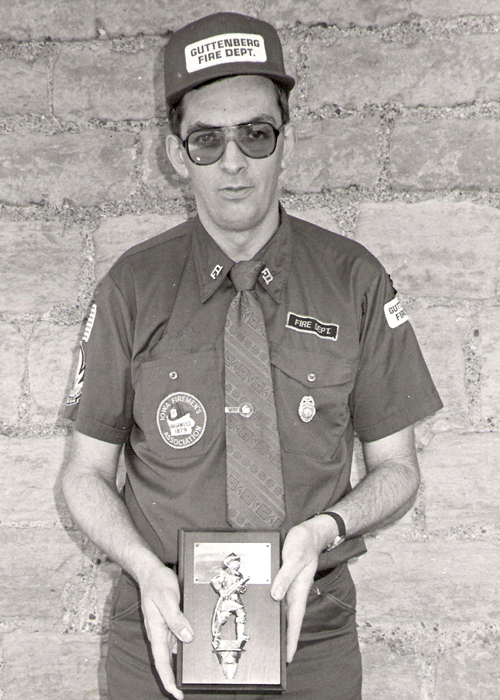 In May 1981, the department purchased additional walkie-talkies. In April 1978, the department began working on specifications for a new tanker, which was subsequently purchased at a cost of $21,000, arriving in July 1979. That same month the first Ford truck was stripped and the city began using in for a dump truck. 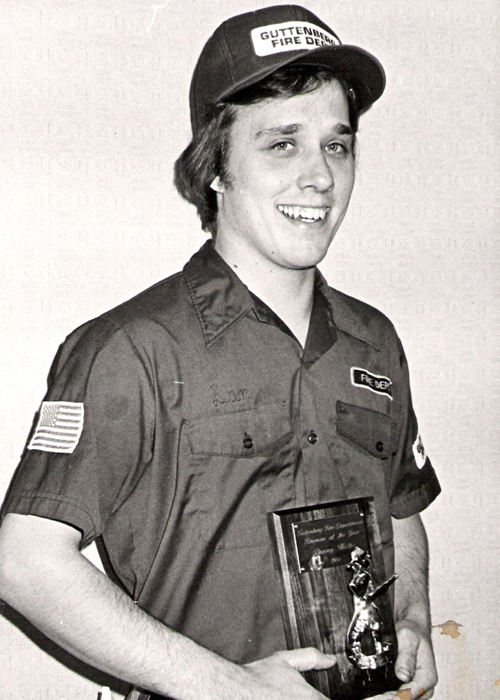 In June 1978, Owen Pufahl received the Governor’s Award for Meritorious Service. 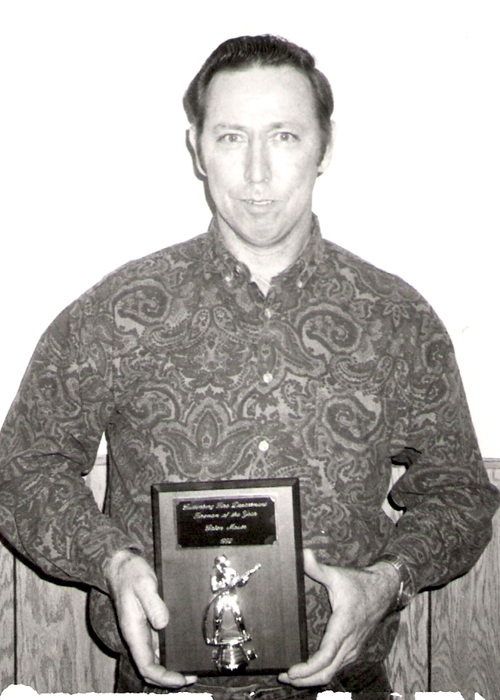 Les Aulwes received the same award in June 1981. In September 1980 a new floor was installed in the station by the city, and in December of that year a new ceiling was put in with the fire department providing the funds and labor. Funds for the renovation were raised by the firemen, with the first in a series of annual benefit dances begun in March 1974. By January 1981, the first station and hall were called complete, finished at a total cost of $19,162.18 raised by the department. 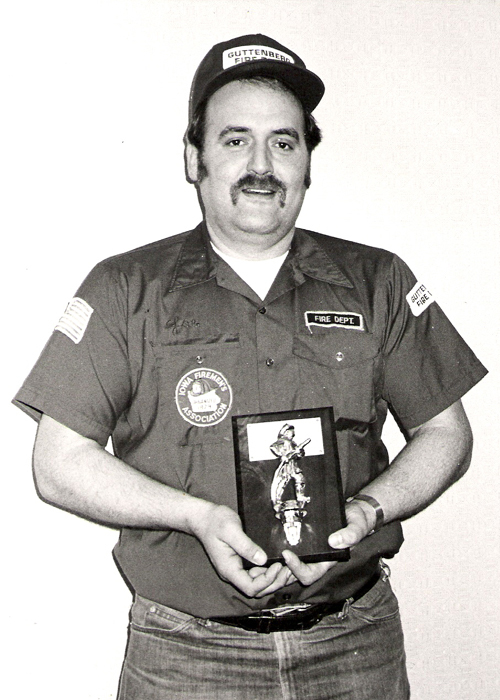 In 1980 the department began its “Firefighter of the Year Award” for meritorious service, and the first year it was awarded to Darwin Duwe. 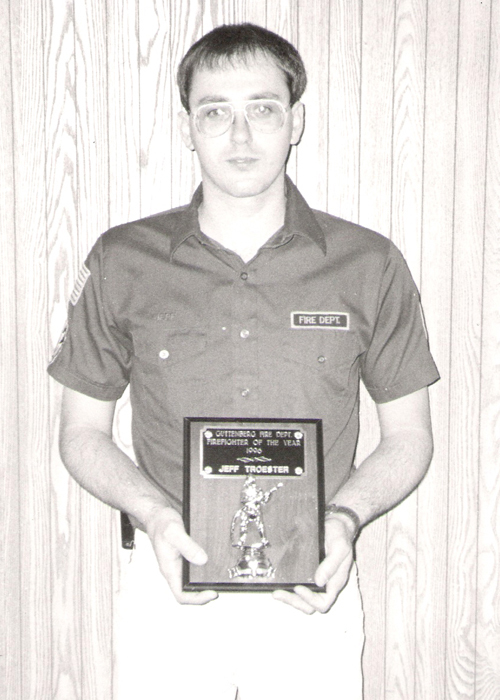 The following year Lyle Moser was recipient of the award, and in 1982 Gary Leliefeld received the honor. Other equipment added included a foam unit and one air mask received in July 1981. 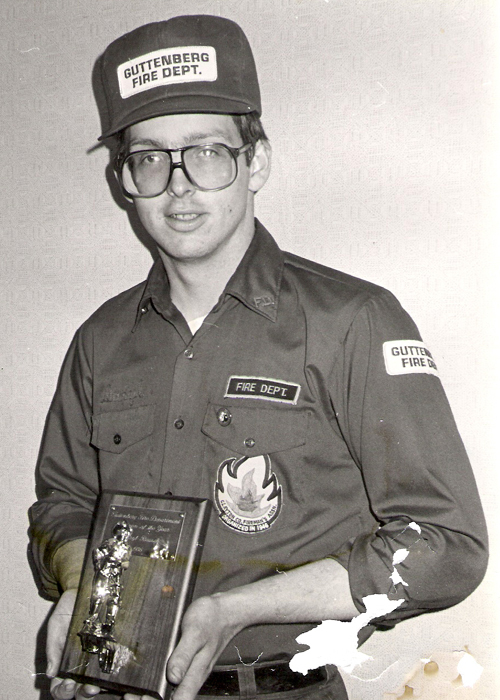 In 1982, the Guttenberg Fire Department celebrated its 100th anniversary with a celebration on the Fourth of July weekend. 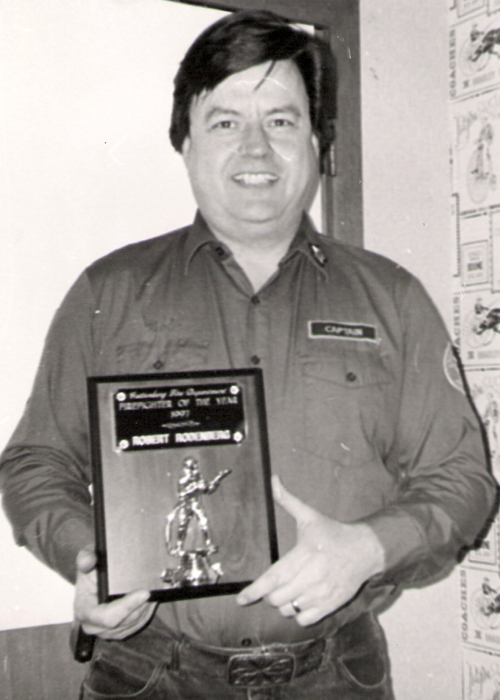 Joe Moser was named Firefighter of the Year in 1983; also, a new chief’s vehicle was added in the same year. 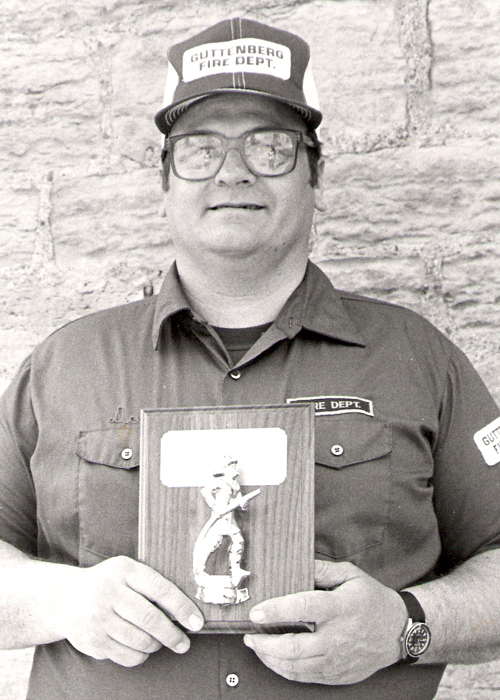 In 1984, Danny Walke received the Firefighter of the Year award, followed by Lester Aulwes in 1985, Daryl Rausch in 1986, and Augie Petsche in 1987. The original hose cart that was purchased by the city in 1882 was restored and unveiled in 1987. 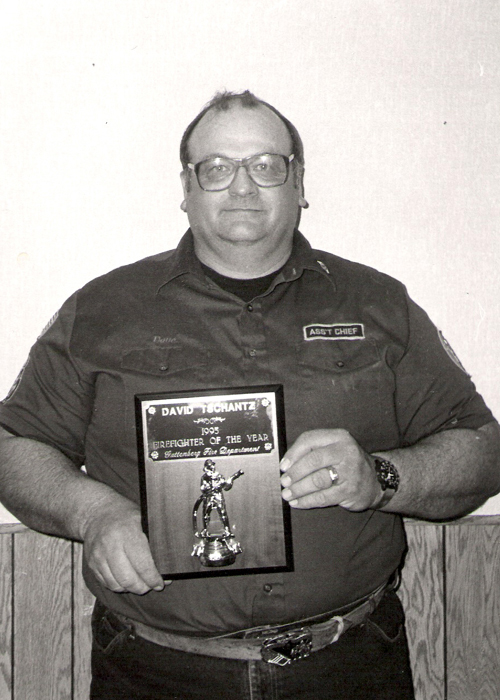 In 1988 Firefighter of the Year was Dave Tschantz, followed by Tim Kuempel in 1989. 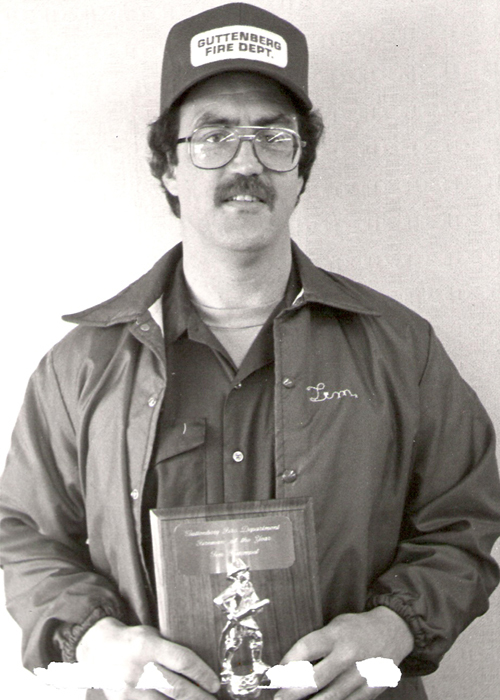 In February of 1989 Les Aulwes retired with 50 years of service and service as treasurer for 33 of those years. In 1989, the Guttenberg Fire Department acquired a brush truck to help fight grass fires. In the fall of 1991, the Guttenberg Fire Department received a new 1000-gallon-per-minute pumper. The pumper had a 1250-gallon tank and had 500 gallons more capacity than the old pumper. 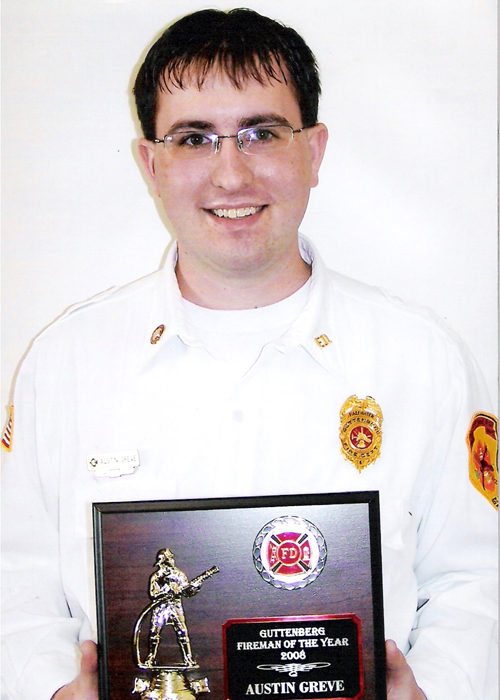 The truck replaced a 1952 500-gallon-per-minute pumper. The apparatus was built by Central Fire Equipment of Lyons, S.D. and is mounted on a 1991 Topkick chassis. The $89,152 truck was paid for through fire replacement funds. 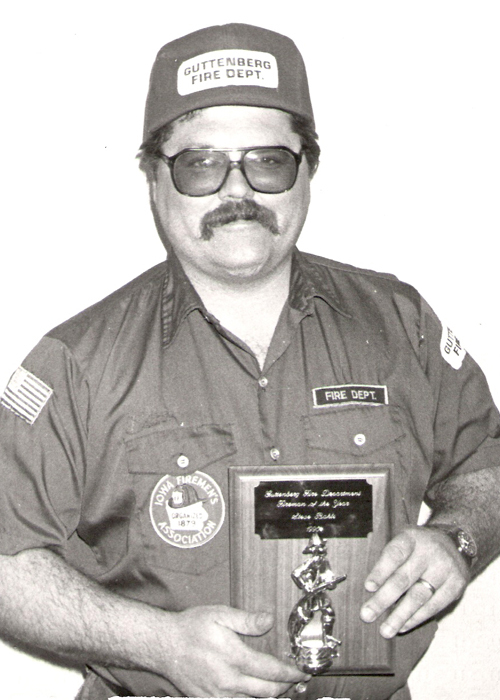 Steve Bahls was awarded Firefighter of the Year in 1990, Marv Pedretti in 1991, and Galen Moser in 1992. In May of 1992, the Fire Department received approval from the city to fix the 1973 pumper truck and began a three-year program to purchase 1500 feet of fire hose. 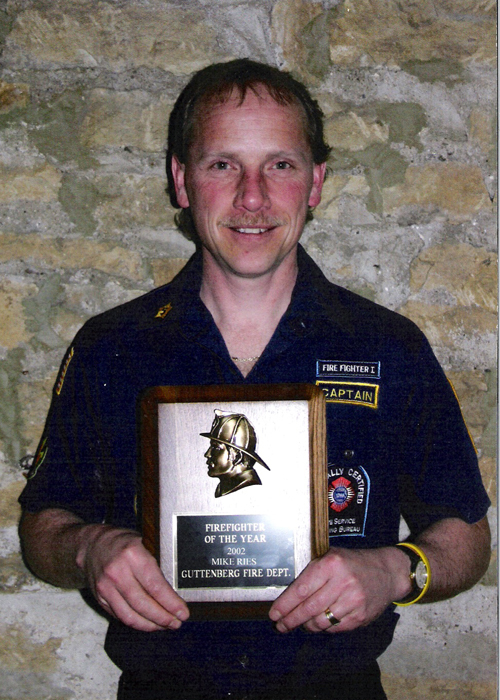 In 1993, Keith Saeugling was named Firefighter of the Year, followed by Stuart Wardenburg in 1994, Dave Tschantz in 1995, and Jeff Troester in 1996. Four self-containing breathing apparatuses (SCBAs) with four Surpass 88 devices were purchased in 1997 for $6,000 from the dance fund. A new weather computer was leased in 1997 to help with weather spotting. In 1998 a grant from the Upper Mississippi Gaming Corp was used to purchase a new motor for one of the rescue boats and a laptop computer was donated from Utilicorp Energy in 1999, to help with data tracking. 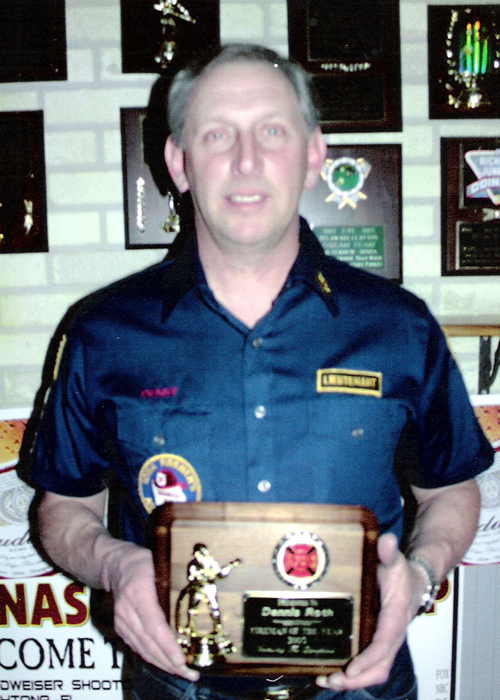 Firefighter of the Year was awarded to Bob Rodenberg in 1997, Paul Moser in 1998, Fred Schaub in 1999. In 1998 and 1999, $9000 in new pagers were purchased using dance funds. There were many additions to the department in 1999. The fire station expansion project was complete with a new addition. A new brush truck, a 2000 Ford F450 and 1999 Chevrolet Suburban were added to the fleet along with a used 1993 Ford pumper. A 13000-watt generator was donated the department in 2000 to provide power to the fire station in the event of an emergency. 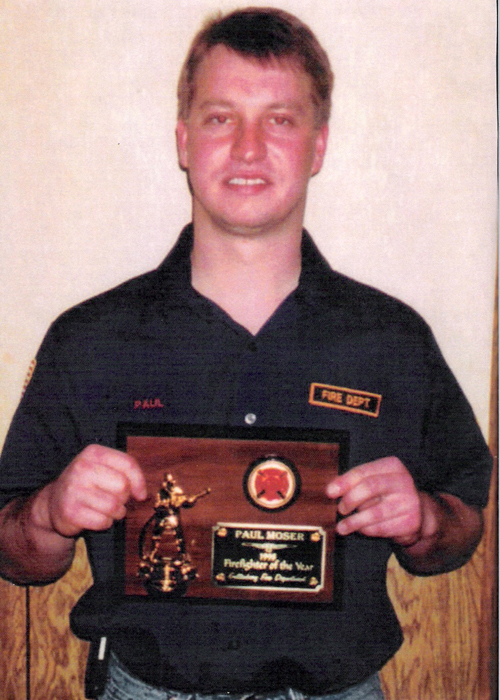 In 2000 Firefighter of the Year was Mike Radl followed by Chad Willenborg in 2001 and Mike Ries in 2002. 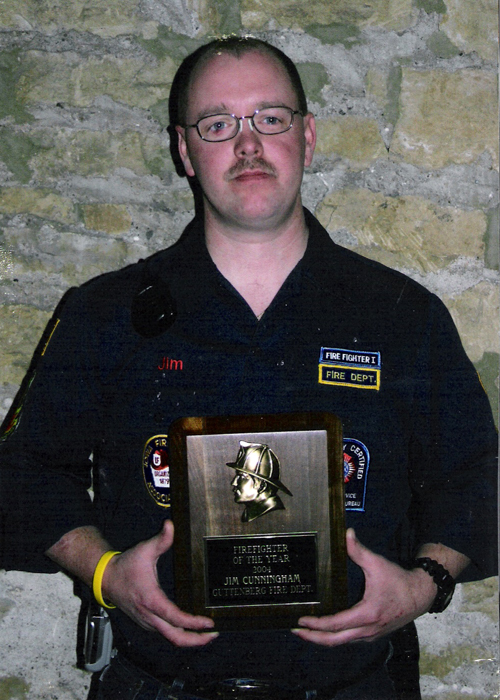 In 2001 and 2002, two grants were received from the Dubuque Racing Association to purchase a new motor for the rescue boats and a new set of rescue tools. A depth finder was donated in the fall of 2002 for one of the rescue boats. Also in 2002 a grant was received from FEMA to purchase a thermal imaging camera and accessories in the amount of $14,400. A grant for new hose was received from Upper Mississippi Gaming Corp for $7737. Wildland and extrication gear and boots were purchase with dance funds in the amount of $4920. In 2003 a grant for $5000 was received to help with the purchase of new bunker pants. A grant was also received from FEMA in 2003 to purchase new SCBAs in the amount of $40,800. 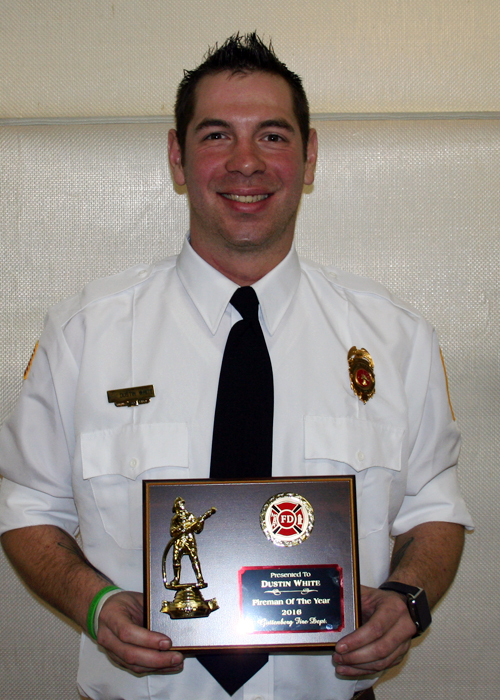 Firefighter of the Year for 2003 was Joel Moser, followed by Denny Roth in 2004. In 2005 a grant from FEMA was received to purchase a 2006 International tanker truck. The new truck was built by Central Fire Equipment. Total cost of the new truck was $135,000. 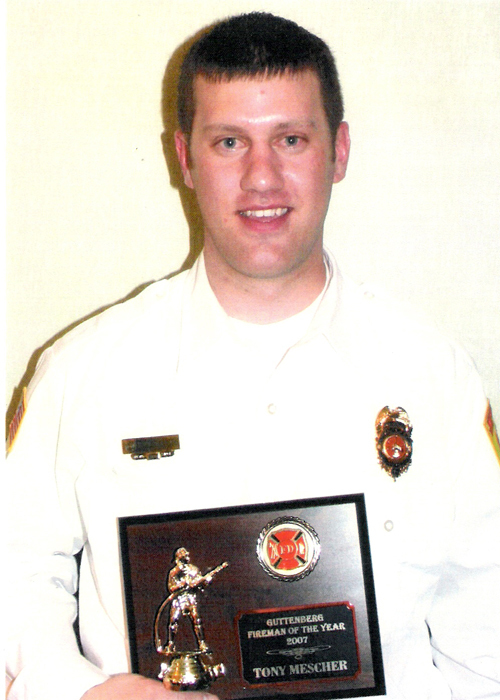 Also in 2005 new bunker coats were purchased with funds raised by the annual benefit dance. In January 2005 an exercise room was created at the fire station using equipment that was donated to the department by area residents. 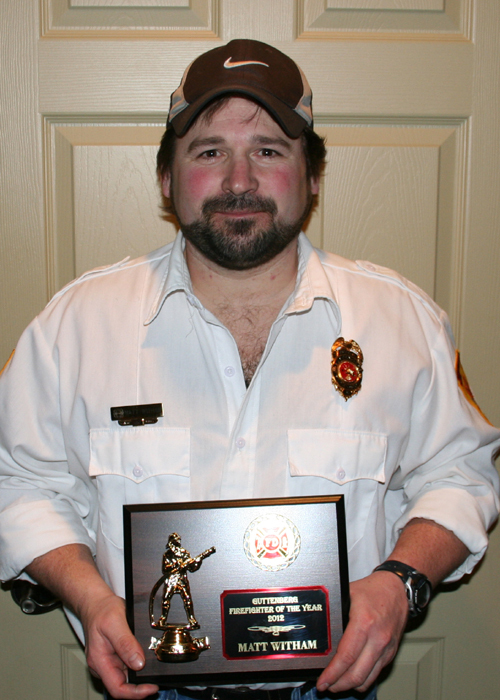 Firefighter of the year in 2005 was Jim Cunningham, followed by Joe Zittergruen in 2006, and Jason Hefel in 2007. 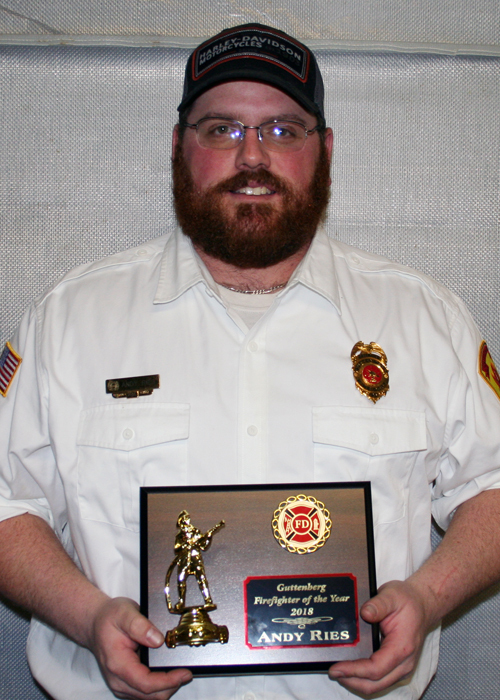 May 5, 2007 marked the 125th Anniversary of the Guttenberg Fire Department. 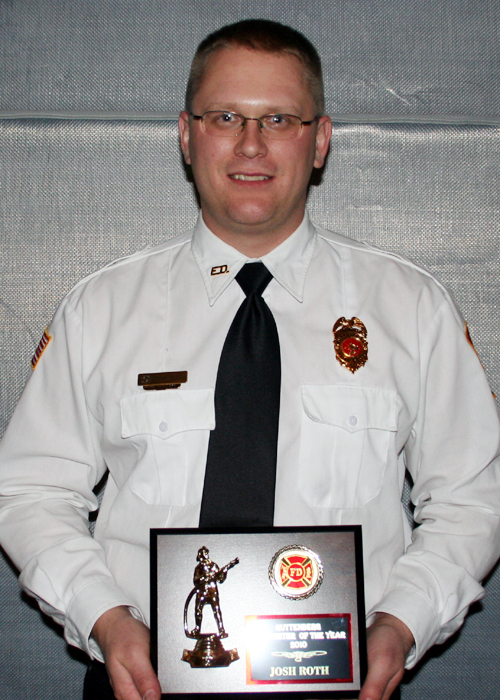 Firefighter of the year in 2008 was Tony Mescher, followed by Austin Greve in 2009, Glenn Witham in 2010, Josh Roth in 2011, Matt Witham in 2012, Mat Ries in 2013, Jarad Esmann in 2014, Larry Goedken in 2015, Ben Tubbs in 2016, Dustin White in 2017, Andy Ries in 2018 and Chad Esmann in 2019. Twenty-four men have led the department since its formation. 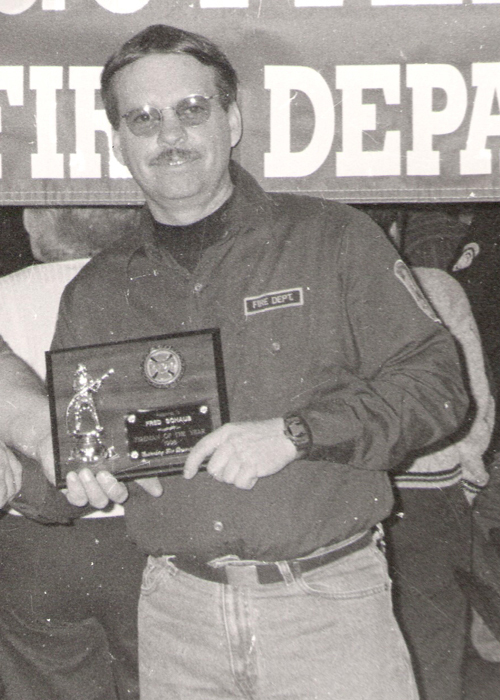 Jim Cunningham, the present chief, joined the department in 2002. 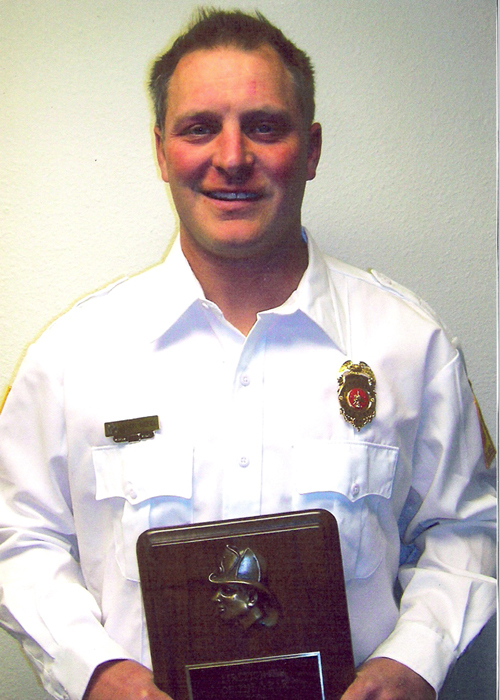 ​At the first regular meeting of the Rescue Fire Company, William Nolte was elected chief and served until 1906 when J.P. Stoeffler Jr. was chosen to lead the company. Stoeffler was succeeded in 1907 by Mike Gilbertz who served until 1916, when C.W. Scholz was elected. Ed Huene was appointed chief in 1918 and was succeeded by C.B. Eckhart in 1919 and J.S. Herboldshiemer in 1920. Four years later, Rudy Reinitz was given the leadership post. 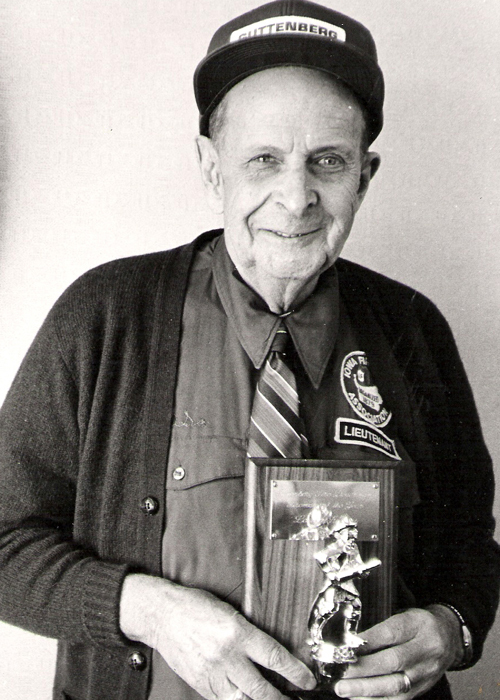 He held it for three years and then turned the chief’s duties over to Ernest G. Pufahl. Ray Frommelt became chief in 1929, Armin Grossell in 1932, and M.A. Abel in 1935. 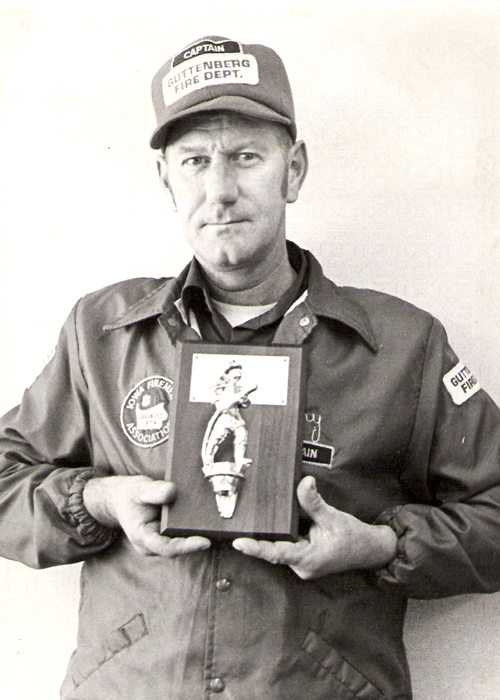 Ernest Pufahl served the company for 50 years, 34 of them as chief. He joined the force in 1923 and was elected chief in 1927 and 1928. 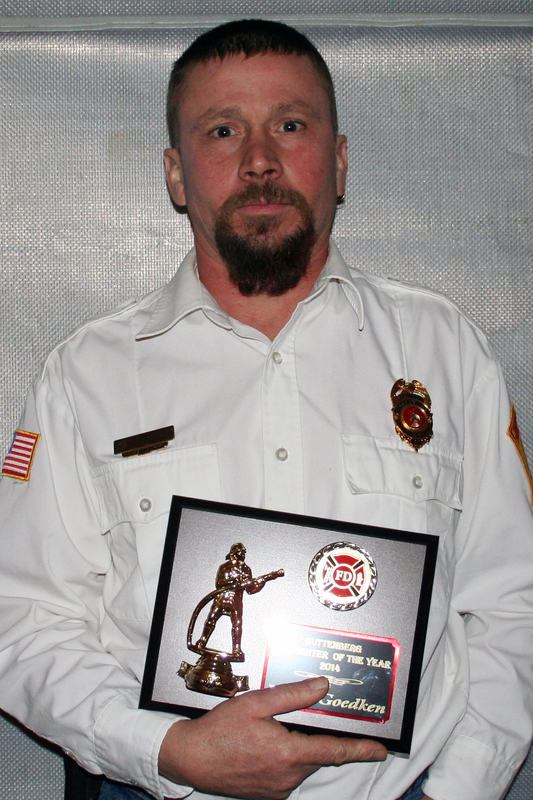 After ten years of service, he received his diploma, an award for faithful service. A change in rules in 1936 enabled Pufahl to rejoin the company. Four years later he was again elected chief, and was re-elected every year until his retirement on Dec. 12, 1972. 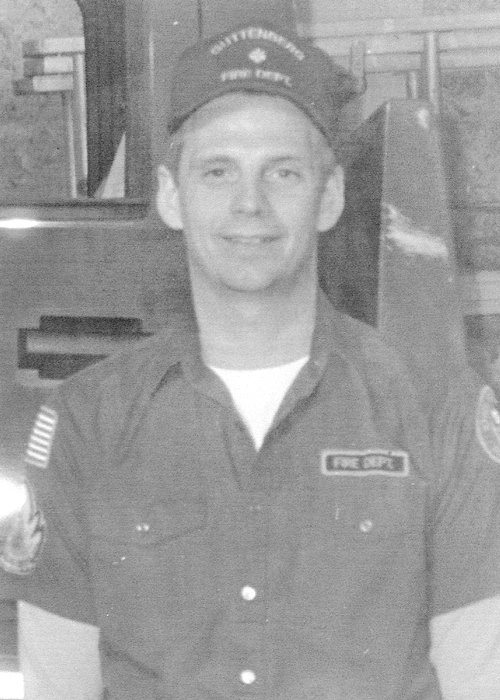 Owen Pufahl joined the department in 1947, and was named fire chief in 1973, following the retirement of his father, Ernest Pufahl. Owen was re-elected every year until his retirement on December 13, 1988. 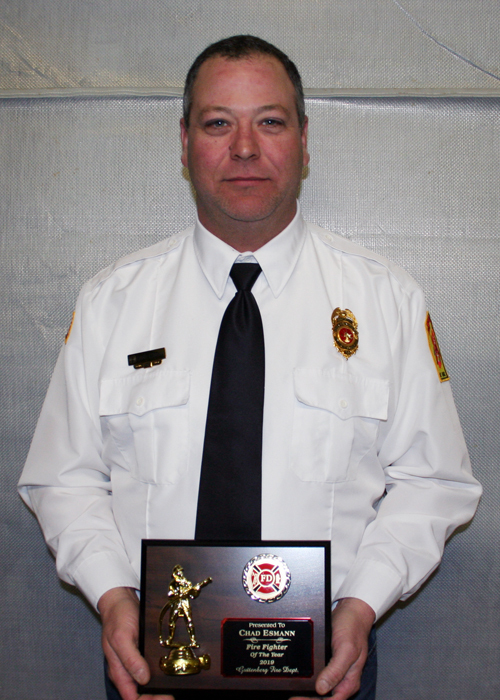 Assistant Chief Larry Crubaugh was named chief after the retirement of Owen Pufahl and served for one year. 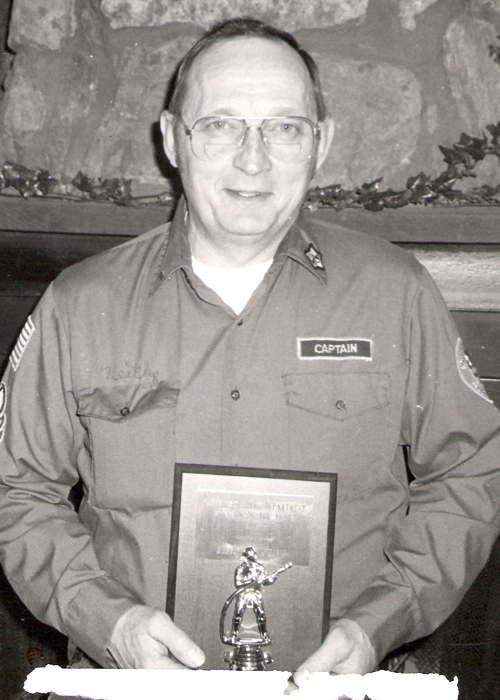 Keith Saeugling was named chief on Jan. 9, 1990. 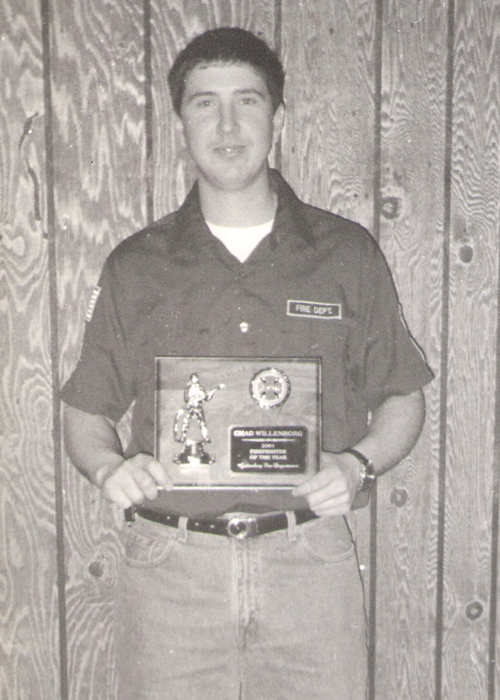 Dan Walke served as chief in 1991 and Daryl Rausch became chief in 1992. 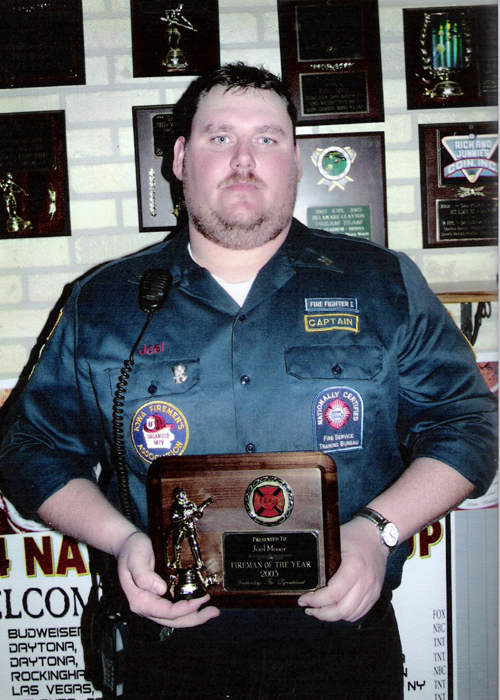 In 1996 Dave Tschantz took over as fire chief, followed by Mike Radl in 2001, who served as chief until 2002. 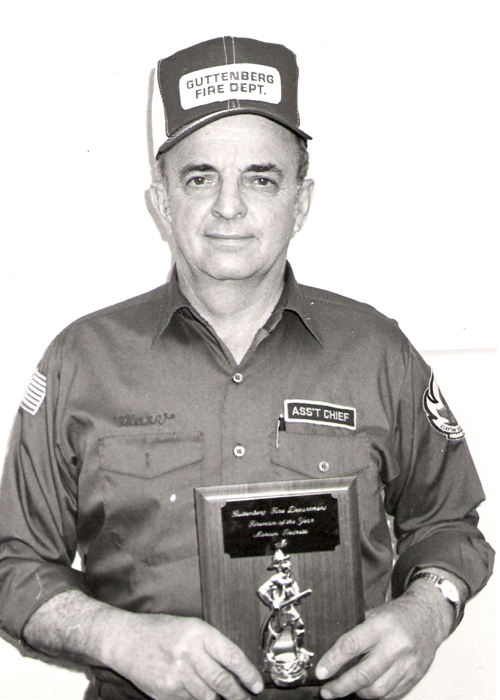 Fred Schaub served from 2003-2010. Jim Cunningham took over for 2011. 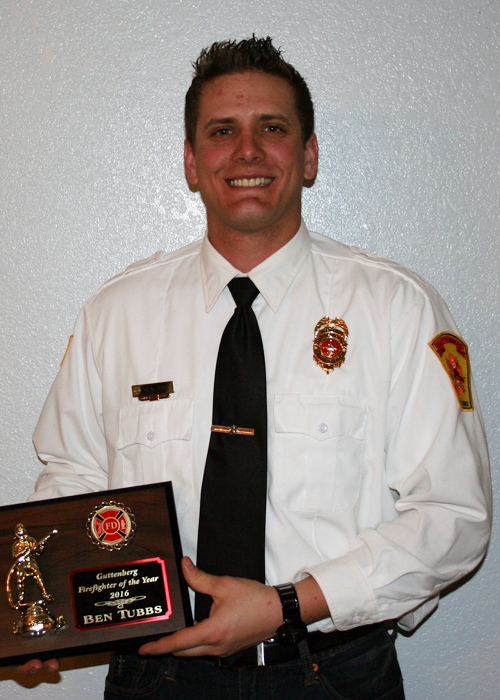 Chad Esmann served from 2012-2015.